Below are some of the Town of Fox Creek’s most frequently requested Bylaws, Policies and Permits. If the Bylaw, Policy or Permit that you are looking for is not found below, please call the Town Administration Office at 780.622.3896 or email emily@foxcreek.ca. A short synopsis has been provided as well as the ability to download the document in its entirety. If you have a bylaw complaint to make to the Town, contact the Town Administration Office during office hours. Bylaw tickets can be paid at the Town Administration Office during regular business hours. If you have a complaint against an issued ticket, please complete a complaint form at the Town Administration Office or at the RCMP Detachment. The Town of Fox Creek is committed to recognizing individual, team, organization and business achievements. The Town will recognize the various achievements through a letter of Congratulations, Certificates of Recognition or an Award of Merit depending on the achievement. Please read all requirements, fill out the forms below and hand them in at the Town Administration Office to have the special event recognized! All dogs must be properly licensed on a annual basis. The Town will not permit or license a dangerous dog within the Community. No owner shall suffer, permit or allow for any reason, his/her dog or other domesticated animal to be at large within the Town of Fox Creek. A Peace Officer may seize and capture any animal(s) found running at large or running loose, and may impound said animal(s) in the Town Animal Shelter. The Town contains NO designated off-leash areas. The Town of Fox Creek contracts out Superior Safety Codes Inc. for Permits and Inspections within the Town. Contact Superior at 1.866.999.4777 or visit www.superiorsafetycodes.com for more information. A valid Business License is required to operate a Business within the Town of Fox Creek. The Business License Bylaw allows for licensing, control and regulation of Businesses within the Town. New applications or License renewals can be made at the Town Administration Office. The Cemetery Bylaw regulates and controls the operation of the Fox Creek Cemetery. The Town of Fox Creek is responsible for the selling of burial and cremation plots. The Curfew Bylaw was passed to regulate the time after which children shall not be in a public place at night without proper guardianship. The Curfew Bylaw is to assist parents and legal guardians in exercising authority over their children to keep their children safe from harm. The Town of Fox Creek Council is committed to preserving a community quality of life which emphasizes individual safety of children, and well being as well as the protection from harm of public and private property. No child (17 years of age or under) shall be in a public place within the limits of the Town after the hour of 11:00 pm and before the hour of 6:00 am the following day without proper Adult Guardianship or a Legitimate Excuse. Any child that is found in a public place during these hours is guilty of an offence and is liable to receive a fine of not less than $100.00 dollars. The Guardian that has allowed the child to be in a public place during these hours is also liable for a fine not less than $100.00 dollars. The Downtown Area Redevelopment Plan 777-2016, is a statutory plan that provide a set of development policies for the downtown areas. It encompasses the local residents’ vision for the downtown over the next twenty-five years, including options to improve the downtown mobility, streetscape and public spaces, as well as attainable implementation strategies. This Plan is in alignment with the Town of Fox Creek’s Municipal Development Plan 775-2016. To establish General Fees and Charges for Goods and Services delivered to the community in the Town of Fox Creek. This includes water rates, recreational fees and landfill fees. The Town of Fox Creek has a few Bylaws that govern fires within the Town limits. Please refer to the Bylaws below if you are planning to have a fire. Please remember the Town of Fox Creek requires all businesses and residents to obtain permits prior to any open burn within the Town of Fox Creek boundaries. An Open Burn Permit can be picked up from the Town Administration Office for a fee of $25.00 and a signature from the the Fire Chief or Deputy Fire Chief will be required. Fox Creek’s Land Use Bylaw, and amendments, regulate how land and buildings are used, building location, site allocation, building heights, and other provisions to ensure orderly development. The Municipal Development Plan for the Town of Fox Creek provides policy direction that promotes sustainable growth and development, and supports both a high quality of life and economic opportunities for the community. Through a vision for the future, strategic principles, and an overall concept for growth over the next 25 years, both private and public sector actions and decisions can be coordinated to achieve these desired long-term goals for the community. This bylaw provides for the regulation, control and management of off highway vehicles within the Town of Fox Creek. All lots in the Town of Fox Creek shall be sold on a first come first served basis. Contractors / Developers purchasing one lot only are subject to the same terms and conditions as set out for individual purchasers, whether purchasing the lot for a client, or for re-sale. Lot prices include: water, sewer, gas to property line, and all frontage charges to street, sidewalk and street lights. Lot price does not include Goods and Service Tax. The Service Connection Repair Policy deals with the backup of sanitary sewer into private residences and businesses. It is intended to cover only sanitary sewer backup and is not applicable to the storm water drainage system. Consumption of recreation cannabis is prohibited in any form (smoking, vaping, and edibles) in Fox Creek Public Places. The Bylaw does not prohibit a person from consuming cannabis at a residence. 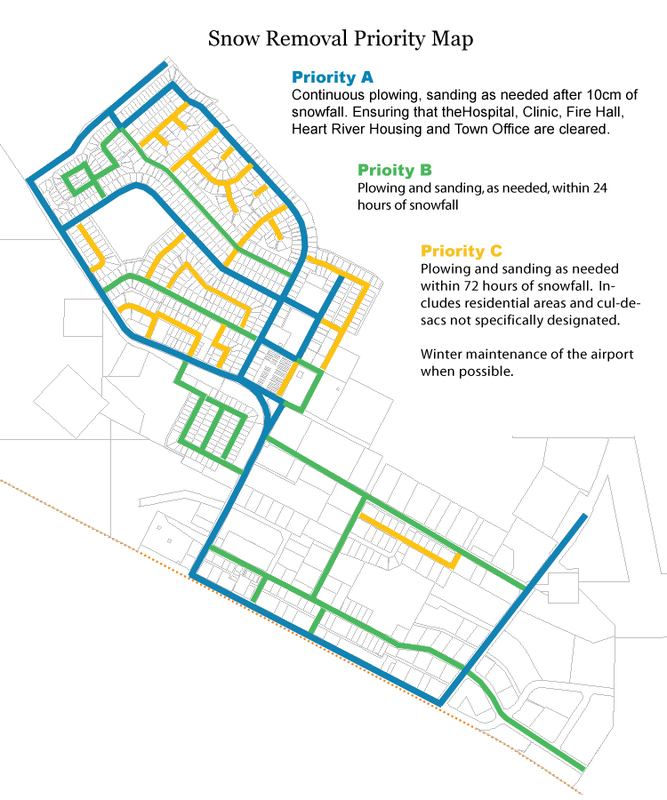 The purpose of the Snow Removal Policy is to establish guidelines and priorities for the removal of snow and for the sanding of streets during the winter season. The Subdivision and Development Appeal Board Bylaw 779-2016 provides the establishment of the Subdivision and Development Board (SDAB) for the Town of Fox Creek. This bylaw is formerly included in the Town’s Land Use Bylaw 662-2007. Now it becomes a stand-alone bylaw, as a continuation of the existing practices of the SDAB. No re-election of the existing SDAB members is required. Recent amendments will be posted when they are available. The Town of Fox Creek Taxi Bylaw 767-2016 constitutes the licensing, regulating and controlling of taxis and taxi businesses within the Town of Fox Creek. To provide for the regulation, control and management of vehicle and pedestrian traffic on streets, roads, alleys and sidewalks, and passage of dangerous goods, within the Town of Fox Creek. The Water Conservation Policy provides residents in the Town of Fox Creek with utility accounts in good standing to receive rebates in the form of a credit on their utility account for the installation of low-flow toilets, shower heads and in-line filtration systems. For more information see the brochure and application form below or contact the Town Administration Office at 780.622.3896. On August 22, 2016 Bylaw 776-2016 The Waste Management Bylaw was passed. This Bylaw brings a few new rules into effect. ALL GARBAGE MUST BE IN A CAN OR RECEPTACLE – any waste that is not properly placed on the curb in a container WILL NOT BE PICKED UP. When garbage is found on a property, regardless of who may have deposited the waste on the property, the owner or occupant of the premises shall be responsible for the proper removal and disposal of the said waste.